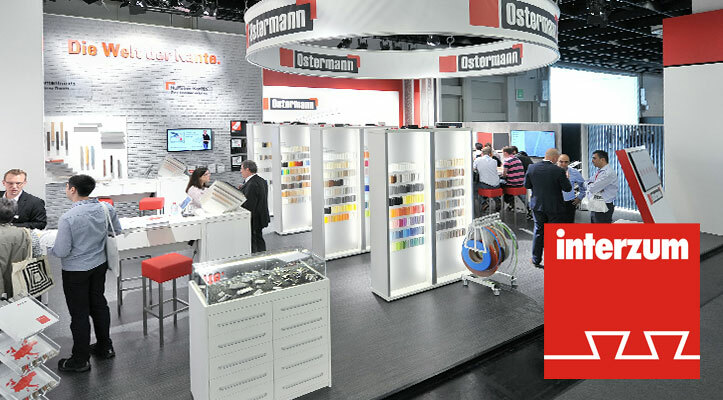 Come and see Ostermann at Interzum 2019! HomeNewsCome and see Ostermann at Interzum 2019! Interzum, the international trade show for suppliers to the furniture and interior design industries, will take place in Cologne from 21st - 24th May 2019. As a partner to the trades, Ostermann will be there once again this year with a stand in Hall 10.2 (stand H-070) and we are looking forward to showcasing the latest trends and edging innovations as well as new products from our range. Ostermann supplies many relevant products for furniture construction from one source, and sees itself as a service specialist and innovation provider for the trades. At the Interzum, the edgings specialist will again provide information on the latest trends and new products in furniture construction with great enthusiasm and a lot of expertise. And there are of course also the matching edgings to new collections from more than 70 board suppliers. At the beginning of the year, Pfleiderer has presented the extension of its range. Among the 34 new decors, there are many cutting-edge reproductions of trend materials, such as concrete, metal, stone and marble. When it comes to wood decors, the trend is for light, natural wood species with balanced, more muted grain and figure. Through the special partnership with Pfleiderer, Ostermann is already able to deliver edgings to match the new collection and will present them at Interzum. For the processing with the available zero bondline technologies, the furniture manufacturer/carpenter needs edgings in different colours, decors, and with varying surface finishes. Ostermann considers itself as a specialist in the area of small delivered quantities and offers with the Airtec, Infratec and Laser edging Europe's largest range of edgings to obtain a zero bondline from one roll. Moreover, visitors can look forward to another trade fair innovation in the area of "zero bondline". How can you deliberately accentuate furniture with modern lighting solutions? Which are the latest trends in furniture handles and handle profiles? And what's new for innovative designer surfaces? Answers to these questions as well as all relevant information on the wide range of technical profiles, cleaners and adhesives can be obtained at the Ostermann trade fair stand. Ostermann teams from many subsidiaries will be on hand to meet the international visitors and provide them with expert, enthusiastic information about our products and services. Trade fair visitors will find Ostermann in Hall 10.2 (stand H-070).